Part 1 of this series gave you an overview of some of the challenges facing telecommunications and media companies, and we presented high-level use cases of solutions built on blockchain that can be created to solve these challenges. Here in Part 2, we provide an overview of a blockchain platform architecture that’s relevant to a communications service provider (CSP) environment, take a deeper dive into some of the earlier use cases, and examine a specific solution that can help you understand how all of the key components come together to provide tangible benefits to the CSP. 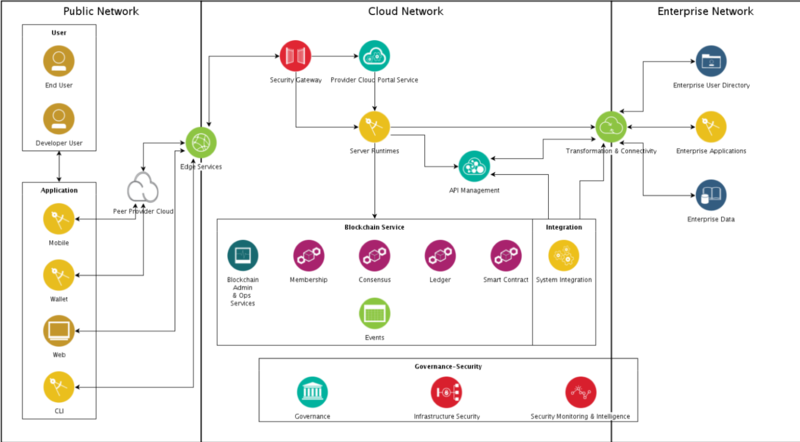 This section provides a high-level overview of the blockchain reference architecture, as well as a sample implementation of the architecture for specific use cases. Figure 2 provides additional technical details on the architecture for each of these layers. Determine the nature of the participation — Will the member participate directly in the network or indirectly through the reuse of peers and certificate authorities hosted by the master organization? The relationship among members, costs, and involvement desired by members are key factors in determining the level of participation. Determine the tooling needed to develop blockchain solutions — Should you use SDK or other options? Carefully determine the tooling you will use as this could have a big impact on development. Enterprise application integration — One option is to develop integration using the Hyperledger Fabric APIs. Client applications invoke blockchain transactions by invoking the REST APIs running in Node.js or Java™ application servers. Another option is to provide support for multiple integration patterns where processing logic is needed; in this case, an integration hub such as IBM Integration Bus can be used. The first option limits integration but the second option can become quite complex. Design smart contracts for flexibility, evolution, and governance — You can encapsulate decision logic in smart contract code, or smart contracts can externalize decision logic to an external rules engine such as IBM Operational Decision Manager. On-chain vs. off-chain data — With the on-chain approach, the data is stored directly on the ledger; the member organization is a direct participant in the network. With the off-chain approach, the data is stored off chain in a shared store such as an object store. Two common problems with CSPs are fulfilling roaming contracts among CSPs and identifying fraud with subscriber authentication across roaming networks. CSPs can use blockchain to address these problems. Identity — The subscriber gets on the roaming partner’s network. The roaming partner determines that this is a visitor from the home operator. 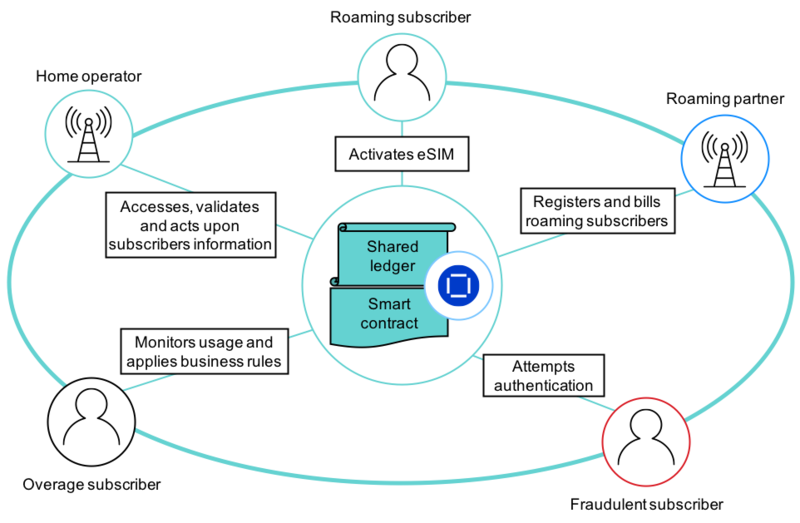 Authentication and registration decisions are then made based on the smart contract. Billing — A call is initialized and recorded on the blockchain. The call ends, and the call duration is recorded on the blockchain. Based on the smart contract, the charges are set and payment is recorded from the home office to the roaming partner. Fraud — A mobile user with duplicate Mobile Station International Subscriber Directory Number (MSISDN) to an existing registered one attempts to connect. Authentication fails and it is flagged for fraud. Overage — Customer calls as the customer has not exceeded the plan quota. The customer is notified of exceeding or potentially exceeding the quota. Figure 4 illustrates the high-level architecture for this solution. When a subscriber arrives in Spain from the Unites States, she connects to a local operator (roaming partner). The blocks are created according to the shared business rules, and the home operator has access to them. The subscriber is now a roaming subscriber. In this capacity, she can make the call. The roaming partner records the call duration and charges the home operator accordingly. The home operator charges the roaming subscribers. By using the same data and business rules, they leave no opportunity for disputes. Two other common challenges for CSPs are seamlessly porting numbers across multiple carriers and conforming to regulatory requirements. And again, blockchain can be used by CSPs to address these problems. Porting request — The user is able to place the request online. Eligibility — Portability eligibility is evaluated in the blockchain by the smart contract following the regulator’s parameters. Approval — Before the portability process is completed, the donor CSP and the recipient CSP need to approve the transaction and the user needs to confirm the new plan. Regulator view — The solution provides the regulator with a complete view of the status of the portability process. Dashboard — The CSPs and the regulator have access to a customized analytics dashboard that summarizes the portability trends and root causes of portability. Figure 5 is a high-level architecture of the solution. The subscriber who wants to port the number accesses the customer portal and verifies eligibility to the port number. If eligible, the subscriber submits a request to a recipient operator. The donor CSP sees the portability request on its system that feeds into the blockchain and approves it according to the smart contract. The recipient CSP can now accept the mobile number portability request and also upsell a different plan. The user can accept the new plan. The regulator has full visibility into the process from end to end. The broadcaster releases an inventory of ad spots for purchase (also known as “up fronts” or “bulk releases”). Ad agencies buy and manage ad spots on behalf of advertisers. Campaigns are assigned to specific ad spots. The broadcaster reports which advertisements aired successfully and determines whether contract terms and conditions (such as target demographics) have been met. All parties can trace the transaction history regarding ad spots. The traditional ad sales process shown in Figure 6 is complex and involves multiple players who have their own systems of record. With blockchain, the new process looks like Figure 7. 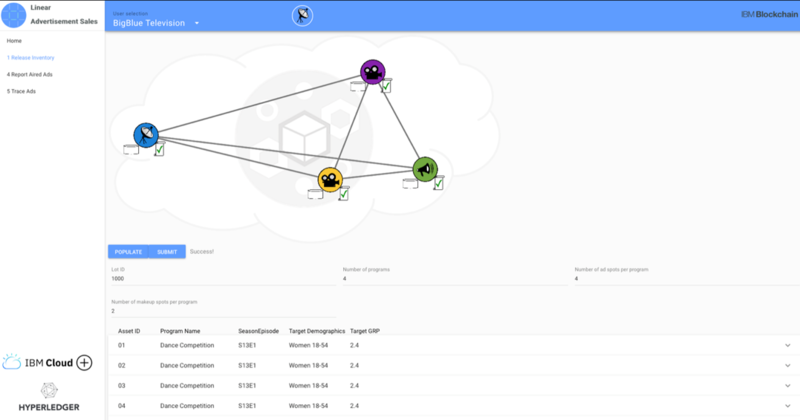 Each player owns a copy of the shared ledger and has a customized filter of the data available for visualization. Data is consistent across the network and is based on shared and approved business rules included in the smart contract. When change happens during the process, a new block is created to record the change and reflect it in the dependent steps of the process, eliminating the need for reconciliation later on. The solution covers an ecosystem of 3 players — advertiser, ad agency, and broadcaster. 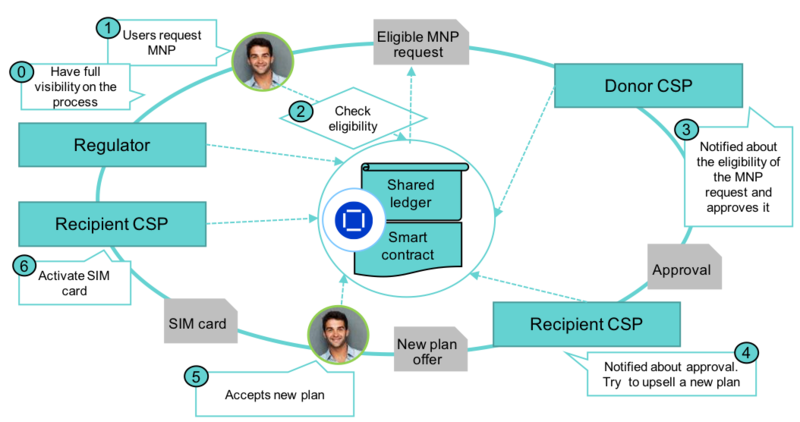 The scenario shown in Figure 8 illustrates how the process flows between different participants that are managed through a blockchain smart contract. Emily from the broadcaster shares an unforeseen change with all the relevant players in real time. Josh from the ad agency approves the change. The shared ledger is updated only after Josh’s consensus is confirmed. Any dependent information (such as billing reports) is updated according to the validated change and the smart contract. Emily does not need to explain the change as it is stored in the blockchain. When Josh receives the invoice, he is already aware of the changes and does not need to start a claim process. Developing this solution requires several components, including blockchain, a UI, and integration with various back-end systems. What follows is a brief overview of the UI and blockchain components. Figure 9 is the view of the UI for this blockchain solution. It shows different views for the various participants: The advertisers are Big Blue Television (broadcaster), GSC Advertising Co. (ad agency), AMS Motor Co., and Netherlands Brewing Co. The block diagram shows the simulation of information flow and consensus between the participants and the shared ledger when any transaction is triggered. In Figure 9, the broadcaster Big Blue Television has released an inventory for TV ad spots available for advertising agencies to buy. You can see a list of programs whose ads may be sold. The UI uses REST APIs from Hyperledger’s REST server to get data and trigger transactions to the blockchain chaincode. All the transactions are governed by the rules in the blockchain smart contract and are immutable once they are finalized after consensus from all participants. The ad agency places an order to buy ad spots and the UI uses the REST API to trigger the transaction on the blockchain. The API invokes the corresponding function in the smart contract script. The response is sent and the new data is made available on the UI via the REST API. We have provided a high-level blockchain platform architecture, expanded on a few use cases from Part 1, and taken a deeper dive into a specific solution to give you a better understanding of how TME solutions can be built on blockchain. In our next article, we will build on this work to show how different external components can be integrated into the platform architecture so that an end-to-end solution can be built using blockchain.